As I said before, I have really been motivated to make some fresh pasta since I got with my new kitchen toy – pasta machine. Making pasta is so much fun indeed. I cooked the first batch of pasta with some homemade tomato sauce, tossing in some chickpeas to add more textures with more protein and fiber. As for myself, the dinner at that night was one of my favourites with lots of satisfaction in cooking and tasting. Since my daughter loves to have all her pasta swimming in the sauce, the amount used in this recipe was quite large. It might be more than you need. So you can reduce the ingredients according to your need, or keep the leftover sauce in fridge for a week or so. The sauce is so tasty on pizzas or breads as well. Open the can and drain chickpeas. If it’s soaked in salted water, use hot water to rinse away the saltiness. Drain well and set aside. Heat butter in a non-stick frying pan over medium heat. Add onion and garlic, cook until soft and fragrant. Be sure not to burn the garlic. It tastes bitter otherwise. Add tomatoes and increase heat to high. Bring it to a boil. Add tomato paste, sugar, salt, pepper, oregano. Mix well and continue to cook until it boils again. Reduce heat to simmer for 20 minutes, stirring occasionally, until sauce thickens. Toss in chickpeas. Once it boils again, turn off the heat. Mix in the basil. Set aside. Use another clean frying pan, add little oil (Note: salmon would release oil when cooked.) Sprinkle salt and pepper on both sides of salmon. Pan fry salmon over medium high heat until cooked to your desired doneness. Use a large pot of boiling water, add about 1 teaspoon of salt to the boiling water. When it boils again, add the pasta and cook according to the instructions of bought packet. For the fresh pasta, cook 3 to 5 minutes depending on how thick your pasta noodles are. The pasta should be cooked through but still gives a sense of firmness. Remember to test by tasting yourself. Drain out the pasta and divide on serving plates. 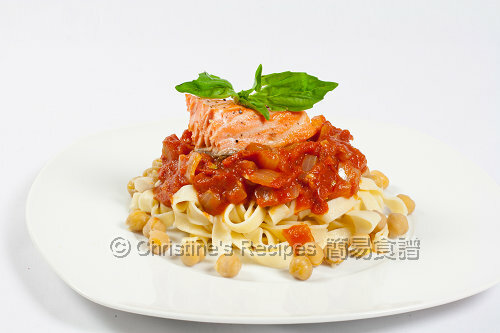 Ladle sauce over the pasta, place salmon steak on top, season with freshly grated lemon juice. Garnish with basil. Enjoy! The amount of sauce might be more than you need. Keep in an air-tight container and chill in fridge. It can keep for a week or so. You might omit the salmon steaks. The pasta is still very delicious if only severed with the sauce. With the salmon, it is really a complete meal. Without it, no doubt the pasta with the sauce is still delicious. The sauce sounds really versatile! Healthy too! Very nice multi-purpose sauce. I was thinking if you would blend the chick peas ... not a good guess apparently : ). Wow making your own pasta at home huh? Does sound like fun hehe. How inspiring! 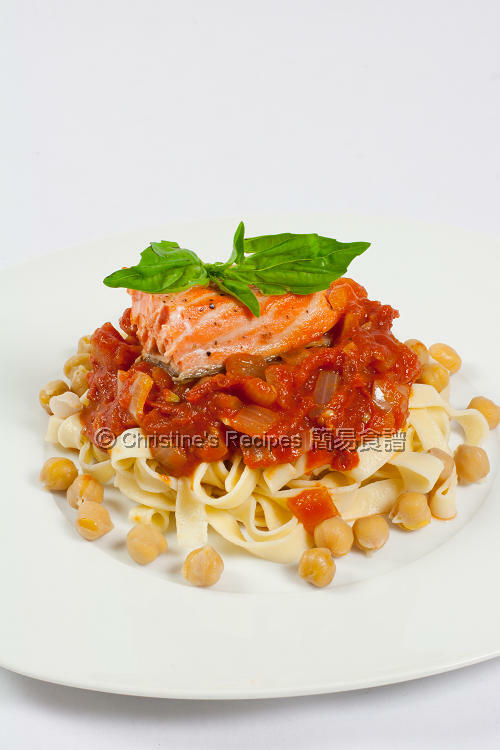 Fresh homemade pasta with delicious chickpea sauce and a large chunk of seared salmon steak atop....this is the one-dish-meal that would bring a big grin on my face!